Set sail with us for a wonderful Twilight Bay Cruise around the beautiful coast of Phillip Island. Make sure you bring your camera as you may see seals and dolphins as well as the beautiful sunset. Set sail with us for a wonderful Twilight Bay Cruise from Phillip Island around Western Port. 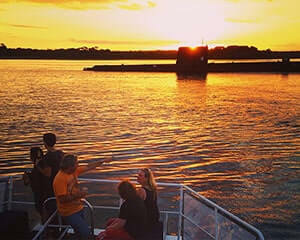 Don't forget your camera - as well as the spectacular sunset over Western Port, you will also see the submarine HMAS Otama, with local birdlife, seals and dolphins frequently sighted. Light nibbles are provided and there is a licensed bar on board where you can purchase drinks and snacks. Please note this Twilight Cruise from Phillip Island does not operate during the winter months. It was outstanding experience for us. and Staff was awesome. Prompt return of e mail and voucher after booking online. Crew on the Sunset Cruise were fun, professional, knowledgeable and created a great vibe. Didn't get to see any wildlife but the submarine relic was fantastic! We loved the trip !